As you may know from recent news reports, there have been lapses in safety practices at federal laboratories involving potentially lethal microbes such as avian flu (H5N1) and anthrax, including an incident involving discovery of 60-year old smallpox vials in an FDA laboratory building located on the National Institutes of Health (NIH) campus in Bethesda, MD. Such lapses, which undermine public confidence in biomedical research and could put people’s health at risk, remind us of the need for constant attention to biosafety standards. Scientists can never become complacent in routine safety practices—one mistake could have serious repercussions. Consequently, we at NIH are taking remedial action and precautionary steps to improve our lab safety protocols and procedures, minimize the risk of recurrence, and increase timely reporting of potential problems. We also want to remind all of the universities, hospitals, and other research organizations across the nation that receive NIH funding that they also need to have their houses in order. Today, NIH issued a Guide Notice to reinforce the message that our grantees must meet all applicable federal, state, and local health and safety standards for research conduct. 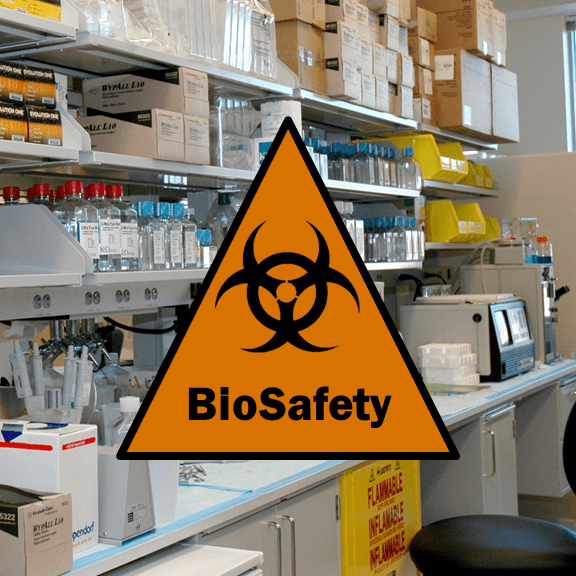 Just as with federal labs, grantee institutions are expected to run rigorous programs of biosafety oversight that include attention to safe lab practices, training, and appropriate policies and procedures. In fact, such steps are actually required in the terms and conditions of all NIH grant awards. Ascertaining the appropriate frequency of training. We urge all of NIH’s grantee institutions to do the same at the local level. National Biosafety Stewardship Month provides scientists all around the country with an opportunity to reinforce existing practices; revisit existing guidelines and resources (for example, NIH’s guidelines for research involving recombinant or synthetic nucleic acid molecules); optimize further biosafety oversight; and strengthen partnerships to achieve our shared biosafety goals. Institutional biosafety committees and biological safety officers will play crucial roles in such efforts, and NIH will be sending them a letter to encourage participation. While grantee organizations are not required to submit documented assurance of their compliance with or implementation of these regulations and guidelines, they should be able to provide such documentation upon request. We hope the entire biomedical research enterprise will join us in promoting conscientious research practices and creating a culture that not only values—but that diligently practices—laboratory safety. Note: Sally Rockey, Ph.D., is NIH’s Deputy Director for Extramural Research; Lawrence Tabak, D.D.S., Ph.D., is NIH’s Principal Deputy Director; Amy Patterson, M.D., is NIH’s Associate Director for Biosecurity and Biosafety Policy. Did the White House issue a Memorandum on Enhancing Biosafety and Biosecurity in the US today, August 28, as referenced above? The link provided takes one to the August 18 White House Memorandum on this subject. Thank you. Thank you for bringing this to our attention. The date on the link should be August 18 rather than August 28, and we have revised the link accordingly.